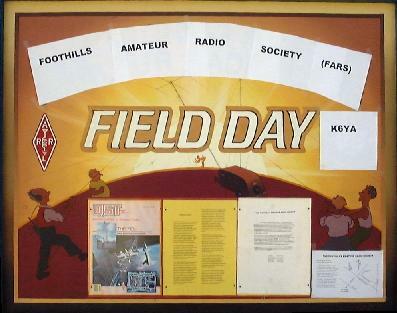 This is the sign marking the information and visitors booth for the FARS Field Day. 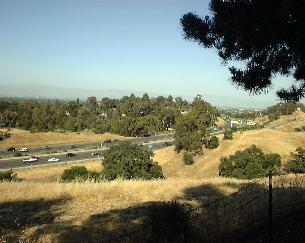 This is the view of I-280 from the Field Day site looking West towards San Jose. The view north from the Field Day site. To the left you can see the green tent for the RTTY station. To the right, you can see the tower for the RTTY antenna. Near the tower, in the distance, you can see one of the hangers at Moffet Field. 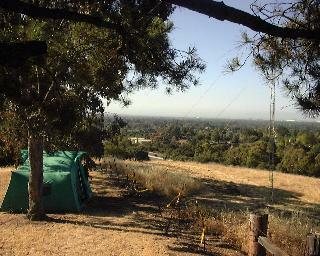 The view looking north from the south end of the Field day site. In the center of the picture you can see the tower and beam for the SSB station. On top of the beam is a co-linear 2 meter VHF antenna. 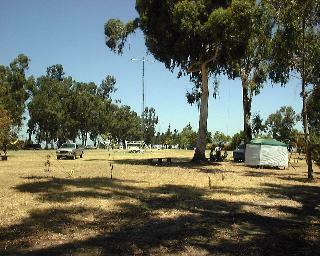 The green and white tent to the left is the VHF station. Just to the left of the tent is the van containing the SSB station. 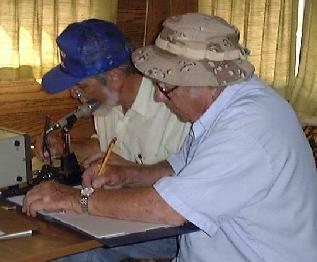 Dennis Paull, KC6PUN (left), operates the Novice station (KC6PUN) while Charles Arney, KC6CUU (right), logs the contacts. Dennis Paull, KC6PUN (left), and Charles Arney, KC6CUU (right) get busy on 10 meters SSB at the KC6PUN novice station. 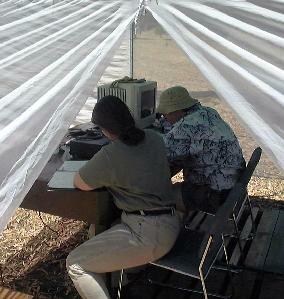 Virginia Zander, KC6WPJ (left), and her husband (right), work 2 meters FM. They came all the way from Washington state just to help out. 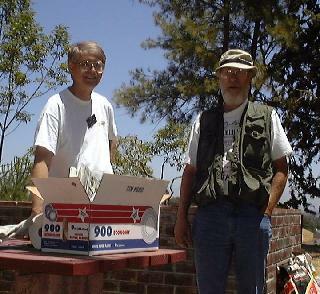 Peter Griffith, WA6VAQ (left), prepares the Saturday barbecue as Herb Davidson, KF6BKL (right), helps out. 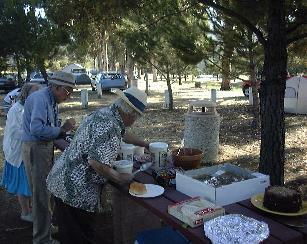 Charles Arney, KC6CUU (front), and George Raven, K6OG (left), check out the eats at the potluck table at Saturday's barbecue. 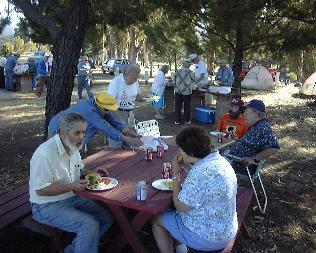 The barbecue is in full swing. 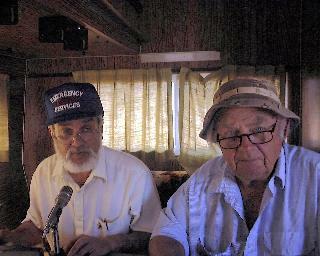 In front Dennis Paull, KC6PUN (left), and Kitty Hevener, WB8TDA (right), discuss some of the activity so far in this year's Field Day. The photos in this directory are Copyright (C) 1998 Howard Califf, KE6PWH. They are published here with permission.